Nyxia Unleashed. Scott Reintgen. Young adult/Science fiction. 2018. 400 pages. 4 stars. Babel gave us tools to fight with. They made us into weapons. It will be their downfall. I received an Advanced Readers Copy in exchange for an honest review. Emmett Atwater thought Babel’s game sounded easy. Get points. Get paid. Go home. But it didn’t take long for him to learn that Babel’s competition was full of broken promises, none darker or more damaging than the last one. Now Emmett and the rest of the Genesis survivors must rally and forge their own path through a new world. Their mission from Babel is simple: extract nyxia, the most valuable material in the universe, and play nice with the indigenous Adamite population. But Emmett and the others quickly realize they are caught between two powerful forces—Babel and the Adamites—with clashing desires. Will the Genesis team make it out alive before it’s too late? Pause and I die; hesitate and I lose; wait and it’s over. 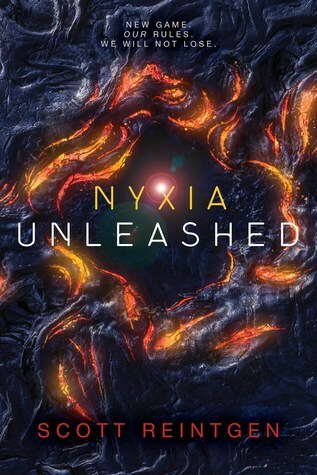 Nyxia Unleashed is a sequel that picks up right where its predecessor left off. We are thrust into a world of chaos and action. I was intimidated to actually start the book because I barely remembered what happened in Nyxia. Fortunately. Bookseriesrecaps provides a very detailed summary of what happened! After refreshing my memory, I was more than ready to get back into the world of Emmett Atwater. This sequel is fast-paced, with so many things happening at every turn of the page. I loved the details of the story. I had no trouble following the narrative of the alien planet because I felt it with Emmett. I was exploring the world just as he was. I never felt like I was an outsider; I felt like I was part of the Genesis. I also tend to forget that the Adamites—I mean, the Imago—were an alien species. They act human and visually look human (unless I skipped a part where they don’t look so?) It really just felt like meeting people from a different country and culture. I lived for the chapters where the Genesis team learned more and more of their world, meeting their kind and trying their food. The chapter where it was all about food is easily my favorites. As for the Genesis team, I grew to love every single one of them. In Nyxia, I picked sides. However in this sequel, there are no sides. There is only the Genesis team. Each of them played a significant role and nobody was sidelined. We learn more about them and we get to understand why they acted the way they did in book 1. I love those who coupled up, and I lowkey crave for the drama that arose in some chapters. It took me a while to finish this book but I never thought about not finishing it because Scott Reintgen is a really talented author. Given that this is the second book in a trilogy, I was positively surprised that this did not suffer through the Second Book Syndrome. It wasn’t boring at all. I am so hyped for its finale and I am filing this under A for Anticipated Release! A huge thank you to Penguin Random House and all the agents that sent this to me in both physical and digital galleys! Previous PostPrevious Scrabble or Books?